Treat your pup to hide-and-seek fun with the Outward Hound Hide A Bee! Just stuff the squeaky bees in the plush bee hive, and watch as your dog sniffs them out. To keep the game going, just stuff them in again and again! Bound to become your best friend’s favorites, our lovable toys are durably designed with an engaging array of shapes, sounds and textures so you can have huge fun with your furry friend. BUSY BEES: Keep your dog occupied through hide and squeak play with the Hide A Bee! 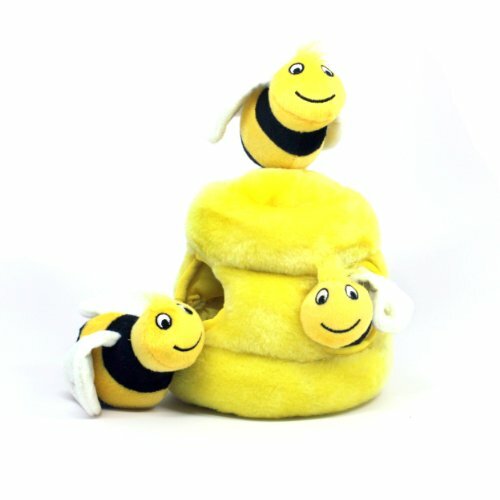 2 IN 1 PLAY: Stuff these squeaking bees into their hive or take them out for fun games of fetch! BEES INCLUDED: Complete with 3 squeakin' bees, the only thing missing from this fun beehive is you and your dog!